Breathe a little...Slow down...: What Choice Do I Have? Warning - a very long winded post ahead. Please only read it when you really have the time and intend to leave sincere comments. This post has been saved in my draft for the past few days. I was actually thinking very hard, whether or not to publish this post because this is my personal issue, and I don't usually post (very) personal issues in my blog. I prefer to just stick to my amateur one-pot & rojak cooking, simple baking, crazy parenting issues alongside with some "kun yam ping" (slave soldiers) at work and occasionally, some nonsense. But in the end, last last, I still decide to publish this post. I need to rant. I so need this. Before you skip my story and scroll straight to the bottom to see the screenshot, let me story you first. You need to know the whole story, yes? If you remember my story Kenzie was supposed to stay with my parents this year for the sake of him going to the kindy. We need to work and leave the house early (7am), so there's no way we can fetch him to the kindy every morning without being late to work (we asked, the kindy around our area opens at 7.30am the earliest). Therefore, we agreed when my mum offered to takecare of Kenzie. But we found a solution and managed to get help from our neighbor who sends her kid to the same kindy. So Kenzie need not go live with my parents and he can be by my side everyday. God was kind to us. Then, there's baby G. What about baby G, you might ask. Ok, all the while, from birth, baby G was taken care by the nanny who lives in the same block of our condo. She is the same nanny who took care of Kenzie. We live on the 12th floor, she lives on the 6th. Every morning before I go to work at 6.30am, I send baby G to the nanny, and I pick him up at 6.45pm when I arrive home. So ok, I got my wish, both kids with me everyday and we don't need to be separated. Perfect life? Wait, read on. About two weeks before CNY this year, I realized there was something not right with the nanny. Every morning when I carry baby G to her, I would have to wait for a long time before she comes to open the door. I could feel she is standing just next to the door, but purposely delay in opening the door for me. And when she opens the door, she would look at me with angry eyes and face full of hatred. She talks to me in a rude tone and looks at me like I'm a freak. She tells me every night, she could hear "ghosts" singing, and that there are many things missing in her house like her keys, clothes, food and other what-nots and says the "ghosts" took them. She even says the "ghosts" come in and cut baby G's hair! She also throws away the porridge that I cook which I bring to her every morning for baby G (don't ask how I know) because she says I cook rubbish for the baby. But when I ask her in the evening did baby G finish the porridge, she says yes! And this is the part where I behtahan most, she says the "ghosts" come in and exchange her meat in the fridge. She swore she bought kampung chicken, but when she wanted to cook the chicken, it has "turned" into chicken bones! (I don't know whether to laugh or cry hearing this statement from her). She bad-mouths me to other neighbors saying I'm not a good mum and I "don't know how to become a mummy" (direct translation in Chinese). OMFG! Our relationship was good before this. I always think of her and buy her many things, like food that she likes to eat. She sometimes ask me to buy meat, fish & vegetables from the market, which I did, and I never took her money. I also never question her or ask many questions about baby G everyday. Every morning, I only tell her what time baby G drank his milk. In the evening, I only ask two things: 1) Aunty, baby got poo or not? 2) Aunty, what time baby drink milk justnow? That's all. I even keep quiet about the daily "thrown" porridge! Am I not good enough? I keep my eyes closed on many things, and as long as baby G comes back a healthy baby, I will continue to keep my eyes closed. Ok, I know it's not good to continue talking about the nanny here, so I will stop here. To cut a long story short, I decided to stop her service and called my mum right away that morning. She asked me to take away baby G from this "gila" nanny immediately and agreed to help me take care of him. So now, our routine is to take back baby G from my mum's place after work every Friday, and send back baby G to her place every Sunday. It's not for long term if you know me. We have our plans. Few days ago, mum whatsapp-ed me and asked me have I found a nanny / am I finding a nanny for baby G. And that was not the first time. She hinted many times already, and it kinda pissed me off. I don't know about your feeling when you are reading this, but I don't feel very good everytime she asks me that question. Hello, what choice do I have? You think I want my baby to be separated from me and I only get to see him two days a week? After I replied, she changed the subject and asked about other things, and "pretended" to send me a picture of baby G.
I sympathize with the stress all working mothers had to face, just like yours. I have heard of even more complicated ones that seems beyond help. This is the reality about life and everyone just need to use their wisdom to tackle one by one. You still have parents and a doting hubby, so the burden is lighter somehow. Last time I remember that your parents were so keen to take care of your older son as you have blogged. (Am I right?) Now the scenario is a bit different and God knows why... It looks like a problem to you but remember that in life, every problem has a solution. It is just that we often refused to accept or follow that solution. Anyway, I won't be able to offer you any advice on finding a nanny except that you can continue to use your wisdom to sweet talk or candy-bribe your mummy until you found alternatives. I really found inspiration to work as Male Nanny at home when I have retired. I am happy to read your comments because I always feel you comment from your heart, and not just simply comment for the sake of just commenting, you un? Yes, mum was very (and I mean very) keen to takecare of the first one because he is bigger and easier to take care. Just give him a Magna Doodle (google it) or a paper and a pencil, and he can sit there quietly for hours. Mum has always liked the first one becoz he listens to instructions, pee/poo by himself, sleep by himself, eat by himself, so it's relatively very easy taking care of him. Yep, in fact the hubs and I just discussed about this issue (again) and currently we have no choice but to continue to candy-bribe my mum, like you said til baby is bigger, and we go on with our plans. There's no way we are going on with our plans now as he is still very small. aiyoh, the nenek moyang of the kebayan!! i can't believe i actually read the whole post top to bottom, head to toe, every word!! and to summary this post, actually it doesn't have to be so long lah, you aje-aje long winded only, to me hor, the first 7 paragraph can actually be omitted, you just start the post from "About two weeks before CNY this year, I realized there was something not right with Baby G's nanny..."
Kam ngam geh.. When I was writing this post, I was thinking in my mind "Hmm, how nice if I know how to hide some portion of the long-winded stories like SK, if people wana read can click continue or read on, if not they can just skip and go straight to the nanny's story"... Aiyoh, you want me to beg you meh? Manja you can or not? We meet up one day, you bring mai your laptop out, I give you flowers and belanja you 1 glass of teh ping, then you teach me ok? okay, so the thing is, you told such a long story but you never even tell a single bit of the thing that i guess most of us are interested to know.. "WHAT HAPPENED TO THE NANNY?? ", i guess everyone was trying to ask this after they read the 8th and 9th paragraph, but then potong stim lah, while we were expecting to hear some thing, you said you are not going to tell further.. so "diu yan" (okay, i mean suspense, not f**k people you are thinking) lah..
Aiyoh, the nanny has depression lor.. Actually, she behaves like this for the past 2 years liao.. But that time, not so serious until like this.. That time, she only mentions "people" coming into the house to steal her things, or the neighbor on top very noisy, that's all.. Didn't mention ghosts and all.. I "yan" her for 2 years liao and put my kid's life in risk.. That day was the last straw as she is getting worse..
Hi Louiz, this is the problem every couple is facing when they have kids and both parents are working especially with the high standard of living now in our country. I sympathize with you especially when you described the "nanny" who feels there are ghosts around the house. If I were you, I would have taken my baby back the moment she mentioned ghosts in the house.. LOL.. call me paranoid! As a mother with 3 grown up kids now, I also understand how your mom feels... one side, you are her daughter and she sure would like to help you all she could to ease your burden. On the other hand, taking care of a baby whom she had just taken over, is also quite tiring for her. I take it that she didn't take care of your baby G when he was just a baby then, right? So it might be quite a handful for her to start to understand Baby G habits and all. I like reading your comments.. Feels like home.. I know where you are coming from.. Afterall, you've "been here, done that"..
People scolded me for only taking actions now. They question me, why I still "yan" this nanny for 2-3 years (from Kenzie's time until baby G's time, baby G was 9 months old when we took him away from her).. From day1 the nanny acted strange and kept saying there's "people" coming into the house to steal her things, then I should have taken actions and grabbed my baby back.. But I still let it go on becoz I "tham fong pin"..If you un what I mean.. I didn't really talk about this with mum..I know my mum and her style.. If I talk to her and ask her can she cope, is she tired, yada yada, she will say "You bukannya nak ambil balik baby, what for you ask me these"... Sigh, in the meantime, he's the only help I have. She promised will look after baby until I find a nanny..
ooopsss, sorry ah!! am i too gossip and didn't actually understand your rantings?? 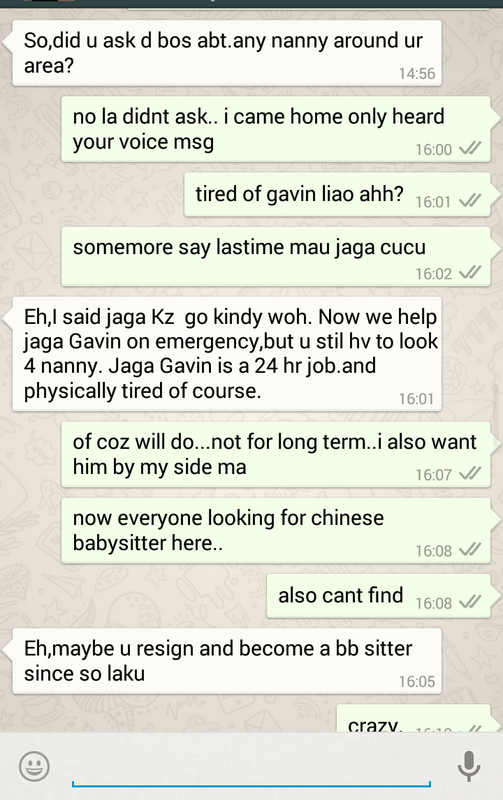 errr, okay lah, i know your situation and caught in a predicament on how to best make arrangement for your kids.. but your mom also quite funny lah, she can whatsapp like a youngsters!! and after seeing her photo on your facebook, i can really say she is such a modern mom!! i think she probably was more concerned about you than wanted to nag you all the time lah, think from the positive side to make your life happier lah.. that's all i wanted to say, i know you have lots to think about and to plan, but stay positive and throw away all the negativity, like how you act like a "sampaat woman" in my blog, hahaha..
Aiyoh, you should "know" me by now, I won't think you are too gossip or what la.. In fact I like reading you all punyer comments..
My mum leh, like you said very modern.. Not those who likes to sit at home and "chau suin" (jaga cucu) type.. Sometimes I don't know what she is thinking also.. 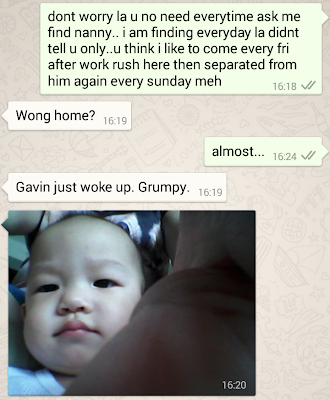 Previously, she so gian wana takecare Kenzie, now she can takecare of baby G also she complaint.. I guess she wants the easy way, as Kenzie is easier to takecare.. I understand what you are going through. I had been in your shoes before. I had baby sitters problems too. If I were to tell you my story, I guess you are way better than me. anyway, problems can be solved. Don't worry too much. Find a solution as you have got no choice. As a parent, we need to be responsible for whatever decision we made. Hope you can cope with the stress and all the best. Yep, I know you've "been there, done that", maybe my problem is not a big problem, like TM said. But right now, at this moment, at this point of time, I'm really stressed and worried, haih.. But currently, mum's the only option. I will stick to her nomatter what, and until I can find a nanny. But I know that's not gonna be anytime soon. Morning Phong Hong. Am replying the comments one by one, and I saw yours now. Thank you for reading my long-winded story. I hate to bore readers with personal issues.. Like I've said, I prefer to just stick to my rojak cooking, simple baking, lazy parenting style, some office flirting and other nonsense.. But this one, gosh, I need to rant, I need this, and I so need to see the comments..
Mum's the only option now. I got no choice. I'm gonna be freaking frank for once. I will "sik ji seong" and "zha zha dai dai" (pretend) and "ya yat kor ya yat" (each passing day).. I will find a solution (I told you I have my plans right), just not now. I need to wait until baby is sssssssssssslightly bigger first..
Oh yes, SK's a humorous blogger.. A bit crazy sometimes, but I like! I started stalking his blog last year after I found out his blog from Meow's blog rolls.. So sorry to read yourpredicament. Your mum should understand and help you, not stressing you further. Hope you find a better nanny soon. Good luck and stay positive, my dear. Ooo you stopped. Good la. I am a SAHM . People ask me to jaga anak I also dont want coz it's not easy to take care of kid leh. Especially babies coz they need a lot of attention. As we grow older, we also no energy jor. Well, now may seems bleak la. Hopefully will be able to find a babysitter la. Then your mom will be more relax. one suggestion...I think there is some indon or what maid that comes in the morning and go back at evening. Have you considered that? Maybe hire one of such service then put at your mom place. same time maid take care of the kids and your mom jadi director. can also help out your mom in housework. The amount of money you pay to baby sitter for both maybe able to hire that maid leh. Check around maid agency and see. Eh apasal you mohon maaf pulak? Where got tersalah cakap oohh?